This entry was posted in Books, Forgotten Book and tagged $106, 000 Blood Money, Dashiell Hammett, Dead Yellow Women, Forgotten Books, Julie M. Rivette, Patti Abbott, Richard Laymon, The Big Knockover, The Continental Op: The Complete Case Files, The Whosis Kid, Who Killed Bob Teal by sanford. Bookmark the permalink. I don’t have this version of the OP stories. Sounds great! 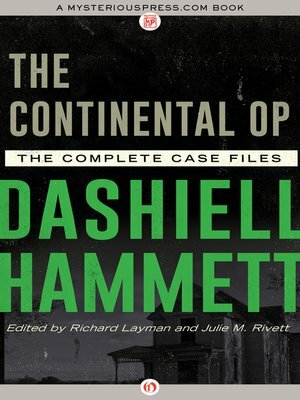 Some of Hammett’s best work is on display in the CONTINENTAL OP stories. I have them all, but not this edition. Really fine stuff. Strange there would be no paper edition so far! I have this edition packed in one of the half dozen boxes of books from my last move. Have read most of the stories, but now I want to dig the book out and read them again!